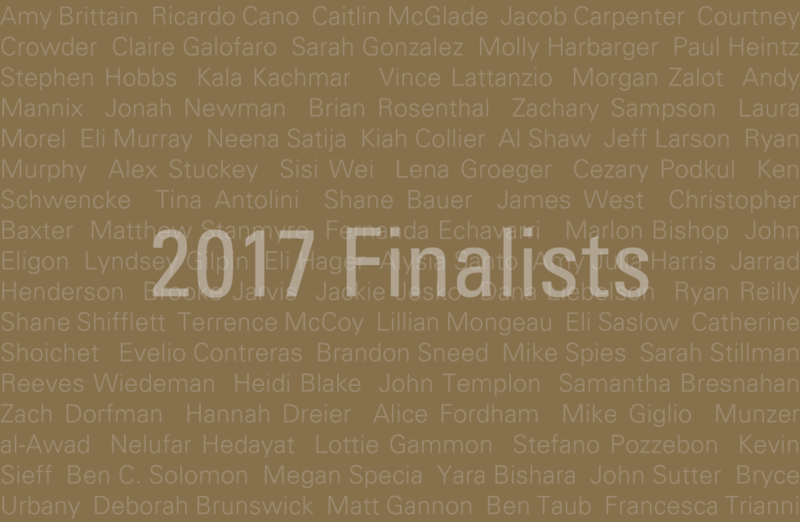 The Livingston Awards for Young Journalists and the University of Michigan announced today the 2017 finalists in local, national and international reporting. The finalists, selected from hundreds of entries, will move to the final round of judging. The awards honor the best reporting and storytelling by journalists under the age of 35 in print, broadcast and digital journalism. The national judges will introduce the winners on June 6, 2017, at a New York City luncheon. Funded by the John S. and James L. Knight Foundation and the University of Michigan to support the vital role of a free and independent press, the awards bolster the work of young reporters, create the next generation of journalism leaders and advance civic engagement around powerful storytelling. “The exceptional quality and range of the finalists is a testament to the vital work journalists are doing every day to foster understanding and accountability locally, nationally and internationally,” says Livingston Awards director, Lynette Clemetson. The Livingston Awards regional judges read all qualifying entries to select the finalists in local, national and international reporting. The regional judging panel includes: Raney Aronson-Rath, executive producer, “Frontline,” PBS; Stella Chávez, education reporter, KERA Public Radio (Dallas); Chris Davis, Vice-President of Investigative Journalism, Gannett; David Greene, host, “Morning Edition,” NPR; Stephen Henderson, editorial and opinion editor, Detroit Free Press; Shirley Leung, columnist, The Boston Globe; and Amy Silverman, managing editor, Phoenix New Times. Andy Mannix, Star Tribune (Minneapolis, Minn.